Preparing For Our Children's Future: Ultimate Blog Party 2011!! 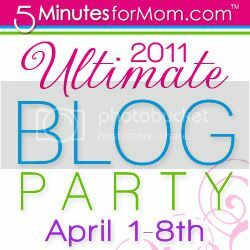 I can't believe that the Ultimate Blog party 2011 is already half way over!!! Aaaahhhh! How come I am always late? I REALLY need a blog partner or two! If you are visiting from the Blog Party and you like my blog and think we have a lot in common, and would like a blog partner, please let me know! Now back to the Ultimate Blog Party! I really appreciate Janice, Susan (from "5 Minutes For Mom") and all the ladies and companies who put together such an amazing and HUGE Blog Party! I love it and just wish I had more time to visit everyone! I love nature, animals and being outdoors, gardening, gathering food & canning, watching my children, reading, listening to Christian music, taking pictures, baking & cooking, watching shows with my family and sometimes sewing! I also love blogging, entering and of course winning giveaways and hosting product reviews & giveaways! So if you have a giveaway blog let me know, or if you are interested in offering a review and or giveaway on my blog, please send me a message! Hope ya'll all have a great time at the Ultimate Blog Party 2011! Stopping in and following you from the UBP! I am also a homeschooling mama. Glad I clicked over from the UBP! Your blog made me smile. I'm a new follower on networked blogs and google friend. Brighten Up Your Outdoors with Pier 1! Yellow Tennessee- Shari's Berries $50 Giveaway! A Mom's Balancing Act- Hoover Vacuum Giveaway! My Silly Monkeys Giveaway- $50 GC to ProFlowers!